Our team are a down to earth and friendly bunch. We love working with like minded people to create beautiful and sustainable buildings. My family and I moved to West Wales in 2003 looking for a more sustainable way of life. I have always been interested in building and learning new skills and was fortunate enough to do an apprenticeship in traditional Rural skills at Coppice Wood College in 2004. This gave me a base from which to hone my passion for green woodworking and coppice management. Since then I have worked with the Welsh wildlife trust, Denmark farm conservation Centre, Tir Coed, The Princes Trust, The National Trust, Longwood community woodland and various community groups and educational establishments. My passion has always been in timber construction and exploring the use of roundwood to create beautiful, low-impact and sustainable building frames. With climate change and the challenges we are facing, roundwood timber framing could not be more relevant to create a sustainable future. I have been living in the Lampeter area for some 15 years. Professionally a traditional woodsman, carrying out mainly traditional woodland management, furniture making, charcoal burning and straw bale round house building. I have been running greenwood working and woodland management workshops for the last 10 years both privately and for local organisations such as Tir coed, Denmark farm conservation centre and long wood community woodland group and the odd bit of television work as well. Now working with Ty pren as well was a natural course, still promoting the use of traditional hand tools and the use of locally sourced wood and helping to promote and push forward a more ecological and sustainable future for now and future generations. My journey to Ty Pren has been a nourishing one. 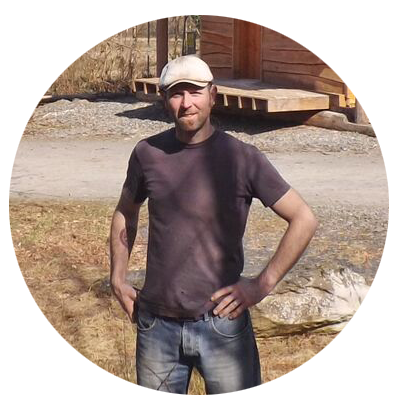 Once I had seen the elements of green craft and round wood timber framing in action, I developed a passion to get more involved in these areas. I volunteered on various builds, and met Jamie Miller who invited me to work with him building traditionally framed buildings. I also studied woodland management at Coppicewood College. Having grown up in Ceredigion, I have always had an appreciation of these beautiful natural surroundings and have engendered an interest in preserving and improving our natural environment for ourselves and the next generation. Ty Pren is offering me a way forward that is in line with my core values ; environmental sustainability, local engagement, and the development of traditional re-emerging skills. I’m Cathryn, aged 33, from the Isle of Skye. I came to Wales in the hope of learning how to live more sustainably. I wanted to immerse myself in traditional skills and discover a lifestyle that differs from our consumer driven norm. I hoped to find a happier, more satisfying way to live that would lighten my impact on our planet. After much research, I decided on South West Wales, it seemed to be an area rich in traditional skills and community spirit. Since arriving in September, I have not been disappointed. I first enrolled at Coppicewood college, a 6 month traditional woodland management course which teaches coppicing and coppice craft. I spent much of my spare time volunteering on various projects and came across many fascinating people and ideas. I kept seeing beautifully crafted buildings that I always commented on, and the response was always the same “That was Ty Pren” or “That was Jamie Miller”. I contacted Jamie in the hope of being able to volunteer with them. When he offered me an apprenticeship I couldn’t believe my luck and jumped at the chance. I love working at Ty Pren, the guys are all fantastic teachers who are passionate about what they do. Everything about the company is excellent, they are enriching the local community in so many ways keeping traditional skills alive, teaching new generations, providing a low impact option to people wishing to build their own homes, creating a market for local timber and producing absolutely stunning buildings to be enjoyed for years to come. I can’t thank them enough for allowing me to learn with them. They are hugely inspiring and I am so glad I found them! After working on various earthen constructions in South America I came to Wales to learn about the different methods of natural building that were being implemented here. Whilst helping Chris and Erica build their straw bale home at Rhiw Las, I saw a roundwood timber frame for the first time – a Tŷ Pren frame. I was inspired, and made it my mission to learn how to timber frame. I found opportunities to learn volunteering with one timber framer and working for another, which gave me my first experiences using traditional mortise and tenon joinery with roundwood larch poles. I was delighted when the chance arose to work with the Tŷ Pren team and I got stuck in on a King Post Truss Frame for Dance Camp Wales. This was an amazing experience for me and I learnt many things from everyone on the build. 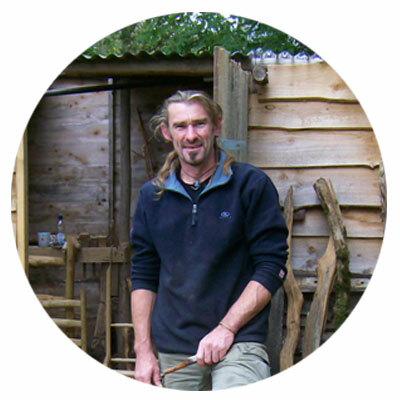 The Tŷ Pren cooperative are enabling me to carve out a livelihood doing what I love – using natural materials, hand tools and human power to build environmentally positive homes, that are aesthetically stunning, healthy and affordable. My name is Emily and I’m originally from North Wales. Growing up surrounded by the Snowdonia National Park it was hard not to develop a deep connection with nature. I have always strived to live and work with the environment in mind hence living off grid in my van and working for Ty Pren. I found a real affinity for the woodland whilst living in the Forest of Dean where I started learning about coppicing and crafts. I wanted to hone in on my knowledge and skills and decided to move to West Wales and I enrolled on the Coppicewood College course as many like me had before…. In fact I met Cathryn on this course. I volunteered a few times with the Ty Pren crew but drifted off back to my seasonal festival work and traditional hedgelaying when I got a phone call asking me to join the team as an apprentice for the big Fordhall Farm build we completed in the summer of 2018. I havent looked back. Working for Ty Pren is truly fulfilling. Merging sustainable woodland management with traditional craft work and all with hand tools, I have learnt so much and look forward to completing many more builds with the crew.